Home » Model Horse	» Breyer Rosalind and Rigel Unicorns! 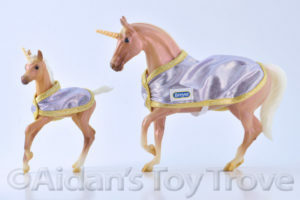 Breyer Rosalind and Rigel Unicorns! Today has been a great day for Breyers and a bad day for the pocket book! First, Breyer released the final 2017 Premier Club set, Carina and Selene. I’m head over heels for Carina and Selene and guess what?! Rosalind and Rigel are must haves for me as well. Rosalind and Rigel are on the Giselle and Gilen mold which were sculpted by Brigitte Eberl. Not only are they wonderful molds but they have been modified to be unicorns! Their color is a pearly looking cremello with lovely looking dapples. Way to go Breyer! 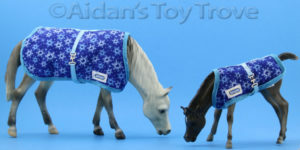 Rosalind and Rigel are Breyer website exclusives. Currently, they are available to purchase to current Breyer Collector’s Club Members only. On November 6th, the set will be released to the general public direct from Breyer’s website. Like other website special runs, this set does not ship with a retail box but rather a plain cardboard shipping carton. Rosalind and Rigel are priced at $75 plus $14.50 domestic shipping. The Breyer Collector’s Club Code CLUBPLUS17 takes 10% off which brings their price down to $67.50 + $14.50 shipping. I will be ordering Rosalind and Rigel along with my Carina and Selene. The cost of just shipping the 2 together is $23.50 Ouch! Make sure you are logged into your Breyer Collector’s Club and you can see Rosalind and Rigel at this link. 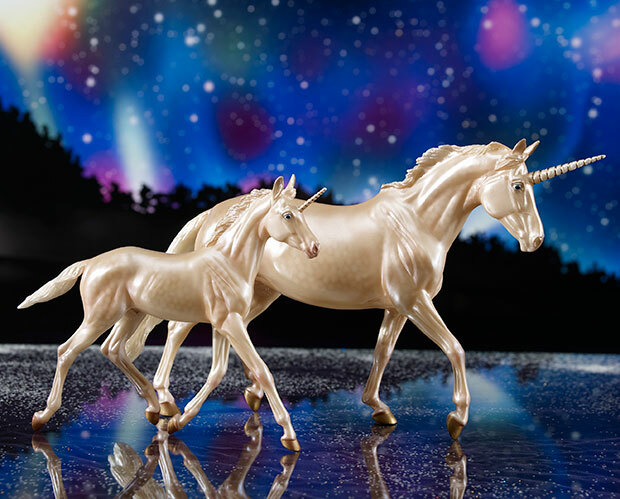 Historically, Breyer’s website special run unicorns have been Classics scale. 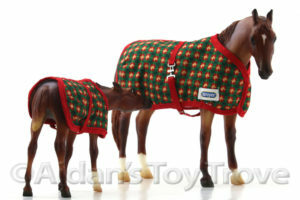 The Breyer website special run mare and foal sets have also had blankets in previous years. I find it interesting that Rosalind and Rigel do not have blankets but perhaps their unicorn magic keeps them nice and warm! Mythical Unicorn Mare & Foal! Club Members get Early Access! Only the pure of heart are given the opportunity to witness the mythical Unicorn! Imagine wandering through a heavily wooded forest, the smell of moss and bark around you, sunlight streaming to the forest floor through the trees, highlighting tiny flowers in yellow, pink, and white. A babbling brook captures your attention. You look up, and there she is: Rosalind, a dreamy cremello unicorn mare, with a shimmer to her cream-colored dappled coat and an accent of gold in her singular horn. You touch her velvety muzzle in greeting, and around her side emerges Rigel, a strapping young colt with a proud expression and confident blue eyes. He’s breathtaking. Am I dreaming? Before you wake up, we’re offering Collector Club members the first chance to purchase this darling duo. For a limited time, you will have access to this set before we release it to all of our web customers. *Early access ends 11:59pm EST on 11/5/2017. While supplies last.